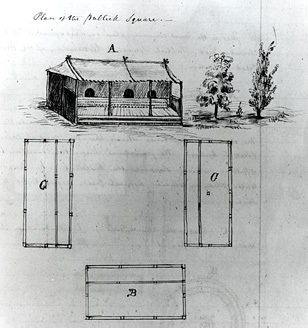 "Plan of a Publick Square" in a Creek Indian village. Engraving by John Howard Payne after Bartram's original drawing. Courtesy of the Historical Society of Pennsylvania. The early Seminoles inherited their civic and social structures from the Creeks. Communities were structured around the square grounds, or talwa, where the town leader, or micco, presided over the council house. Miccos met once a year in a general assembly to decide all-important affairs of state. This was one aspect of Creek government that the Seminoles did not readily duplicate, since their community lacked cohesiveness until the pressures of war united the various bands in the early 1800s. Seminole miccos, like their Creek forebears, tended to come from restricted clans, making the office of civic leadership hereditary. War leaders, on the other hand, established themselves by their deeds. While there were no official ranks for warriors, men could rise through four classes until they reached the highest status, tustenuggee.